The green safety visual on the updated High Traffic absorbents reminds workers to take the necessary safety precautions due to a leak, drip or spill in the facility. Brady (NYSE:BRC), a global leader in industrial and safety printing systems and solutions, today announced its updated High Traffic line of absorbents with printed safety messaging. In addition to a durable design for areas with high foot and forklift traffic, these universal absorbents now include a lime green “Think Safety” icon to remind employees of slip, trip and fall hazards in the area. Brady’s high-traffic absorbents are designed for all-purpose industrial applications. 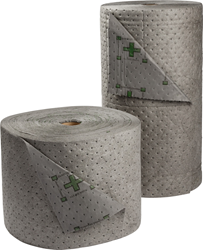 In addition to Brady SPC’s high absorbency, these products feature a 2-ply construction with spunbond coverstock to stand up to the toughest applications. The updated visuals include a gray color to mask drips and spills and encourage longer use, along with the lime green “Think Safety” message to reduce the likelihood of slips, trips or falls in the area. Order the High Traffic absorbents with printed messaging today to take advantage of a durable absorbent and safety signage in one. For Brady’s complete product offering, visit BradyID.com. Brady Corporation is an international manufacturer and marketer of complete solutions that identify and protect people, products and places. Brady’s products help customers increase safety, security, productivity and performance and include high-performance labels, signs, safety devices, printing systems and software. Founded in 1914, the company has a diverse customer base in electronics, telecommunications, manufacturing, electrical, construction, education, medical, aerospace and a variety of other industries. Brady is headquartered in Milwaukee, Wisconsin and as of August 1, 2015, employed approximately 6,400 people in its worldwide businesses. Brady’s fiscal 2014 sales were approximately $1.23 billion. Brady stock trades on the New York Stock Exchange under the symbol BRC. More information is available on the Internet at bradycorp.com.